Los Angeles, CA, December 05, 2017 –(PR.com)– Elegance International (EI) will be holding their popular Open House Event on December 9, 2017 and promises to inspire many makeup artist hopefuls. El is in the heart of Los Angeles, where many have come to fulfill their makeup dreams in the world of entertainment, film, fashion, and theater, and your future as a makeup professional can all begin right there. The EI open house is an opportunity to learn more about the creative environment at EI, interact with past students, take a tour of the colorful campus and speak to instructors about the curriculum and future job opportunities after graduation. 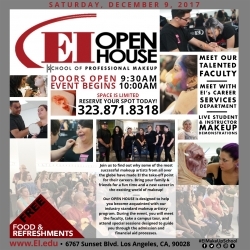 EI is also one of the few makeup schools that provides financial assistance (to those who qualify), so the open house is an ideal time to speak with our helpful staff that will lead you through the qualifying process. After studying at EI, many students go on to have diverse and exciting careers in makeup. EI has supplied contestants for the hit reality show FACEOFF, and the alumni talent have successfully reached nearly every corner of the entertainment world, from television to fashion and beyond. EI promises to be the ideal stepping stone in your career as a makeup artist, and the Open House event is designed to answer any of your questions and set you on the right track. Join them on December 9 to immerse yourself in the campus and find out for yourself why some of the most successful Makeup Artists from all over the world have made EI the take-off point for their careers.